What about "fetch all properties" for Criteria / QueryBy? Very useful yet a simple concept to understand. Thats a good mix. Why didn't you implement this using a query operator, like .Exclude("Text") ? Then you can make this flexible at the spot where you need it without having to specify anything in the mapping file. You then also could have added a method to fetch the excluded fields for a set of entities or an entity. This would then fetch the fields specified for all entities specified (in 1 query) and merge them in an O(n) operation. There isn't a way to specify this for criteria API right now. I am not sure that I am following you. Those type of properties tend to be fixed, vs. something that you change per query. It make sense to make this a global setting, rather than per query. Question: you have a GUI for displaying lists where users can choose columns to be displayed. What about 'lazy' column - won't it cause select N+1 if such column is displayed? Don't bind that column, or eagerly load it. Not sure I like the idea of property access only for lazy properties. It's starting to sound like EF with it's property only access to lazy collections. The reason for that is quite simple, we need to intercept the access. The former could be proxied for lazy loading perhaps? Or perhaps use the latter, CLR string type, but improve on IUserType to support lazy loading? (I'm not sure if we can already do this with a custom NH type). Btw, how do we do bytecode weaving in NH? And why would that be bad? "What this means is that if you mark a property as lazy, it must be a virtual automatic property." Does that mean this won't work for VB code except in VS2010? The problem is that it violates one of POCOness, it you need to use NHibernate's types to handle that. The entity should be aware of its loaded status, either. No, it will work, but you must ensure that you never actually access the field directly. Really nice and expected feature! Could batch be configured for lazy properties? Just a small nitpick as I see this in your posts all the time: it's not "SELECT N+1", that's nonsense. The right expression is "the N+1 SELECTs problem". I call it select n+1. I see, playing Humpty Dumpty? Very nice feature indeed. But, in case of multiple lazy properties, why isn't it possible to load only one lazy property when accessed ? I do however agree on advice of not overusing this feature. b) having two stage load is usually enough, while you can make arguments that it would be nice to have multiple fetch groups, the problem is that you then start making things so much harder on a lot of levels. Just deciding what should go where would be hard enough, then you have the complexity of multiple fetch groups in a single entity, the possibility of loading an entity goes from a select or to to M selects, where M is the number of fetch groups. Something still smells about the whole deal. Can I use the property setter as a way to know when the lazy property is fetched? Can I assume it will only happen once (except when I set the property myself)? No, you can't. To be rather more exact, you won't know when NH is doing it and when some other code is. Your code would work, however. This is very useful for binary data. However, I'm wondering if there is a way that NHibernate can stream the data? Using something like SqlDataReader for sequential access to varbinaries, rather than pulling all the data at once? "As usual, be cautious in over using it.". I can only think of this as a way to prevent some blobs and clobs fetched when we don't need them. But doesn't it lead to the point that we should separate blob and clobs in our storage (as keeping them in separate tables)? 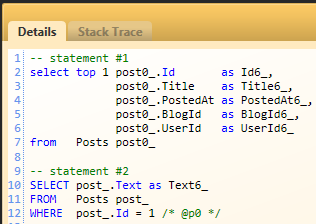 Keeping the Post.Image together as an business entity would make sense due to consistency with customer's language, However in database, it wouldn't be that necessare to keep image in the Posts table. Which approach do you recommend and why? Ayende: Is it possible to mark a Component to be lazyload ? 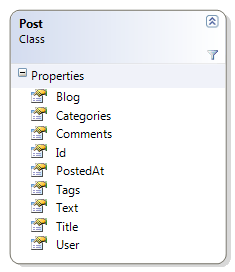 So if any of the properties in the component is accessed all properties in the component is loaded ? I don't _think_, but I haven't checked. It is possible to set lazy=true but it isnt working, that is why i am wondering if it actually should work. I had a dream to start my own business, nevertheless I did not have enough amount of cash to do this. Thank heaven my friend recommended to use the loan. Hence I used the college loan and made real my old dream. Thanks, i have just opened one. I filed it under Bug, but it might actually be a New Feature depending on if it should be possible. "This is very useful for binary data. However, I'm wondering if there is a way that NHibernate can stream the data? Using something like SqlDataReader for sequential access to varbinaries, rather than pulling all the data at once?" "Whenever you pass an object to Save(), Update() or SaveOrUpdate() and whenever you retrieve an object using Load(), Find(), Enumerable(), or Filter(), that object is added to the internal cache of the ISession. When Flush() is subsequently called, the state of that object will be synchronized with the database. If you do not want this synchronization to occur or if you are processing a huge number of objects and need to manage memory efficiently, the Evict() method may be used to remove the object and its collections from the cache. This is really is a nice feature. Lazyloading a component actually also works with the latest code. But there is a really big show stopper. If i query an object an Castle.Proxies.MyObjectProxy is returned, and it is not possible to call any methods on the MyObject object. The method is never hit. It is like it is overriding the methods and never calls the base method. Is this a know issue ? No, it is not a known issue, can you create a JIRA issue for this? btw. i just want to add after having tested it some more, that the proxy works fine (i am able to call the methods on the object) if there is no lazy properties set on the object/proxy. But when a property is set to be lazyloaded, it is not possible to call any methods on the proxy / object being generated.